Apple is continuing to consider producing AirPods with health tracking functionality, but the use of biometric sensors in wireless earbuds presents new challenges in keeping them firmly in place, a problem Apple has also attempted to solve. An often-rumored item, the potential of fitness tracking being built into AirPods or similar devices offers potentially more freedom to those who work out than the Apple Watch. Aside from removing the Watch from the wrist and freeing up the user to more intensive activities, combining the tracking with earbuds can help reduce the number of devices a user may carry during workout routines. A patent granted to Apple on Tuesday by the United States Patent and Trademark Office titled "Earbuds with compliant member" describes ways earbuds could be configured with multiple biometric sensors. These are similar to an Apple Watch, and can include a photoplethysmogram (PPG) sensor, which shines light into skin to perform various measurements, such as heart rate monitoring. Much like an Apple Watch has sensors underneath that need to be in contact with the wrist to perform measurements, similar sensors could be used in earbuds making contact with the ear. The issue then becomes how to place the earbud in the ear to provide an audio experience, while simultaneously pressing against the skin sufficiently for PPG monitoring to work properly. 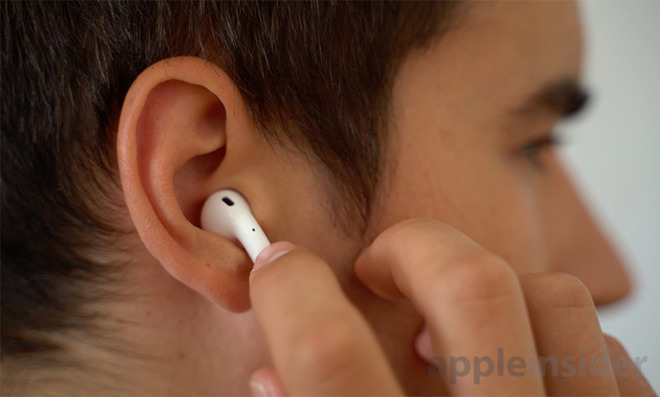 The main way Apple suggests is to perform monitoring using the tragus, a section of skin that lies directly in front of the ear canal, and positioning the earbud in such a way that it can make enough contact to function, while offering enough comfort for users. Apple initially suggests that a contact-based biometric sensor could be placed at the bottom of the earbud, where it can make contact with the ear when wedged into the canal. The wedging provides sufficient contact, but potentially at the risk of being uncomfortable for some users. An alternate version includes a section with a "compliant member," or a section of the earbud that comes into contact with another fold of the ear called the antihelix that can provide more lateral pressure from outside the ear canal, without the need to pressure the canal itself. The member could consist of a foam insert that can compress if a level of pressure is applied by the ear, allowing it to conform while still maintaining the earbud's pressure against the tragus. Such a method is also useful in working for a variety of ear shapes and sizes, with the section potentially replaceable, similar to how current earbud inserts are interchangeable. An alternative is to create an earbud that envelops the tragus completely, but is secured in a different way. Apple suggests a deformable loop that extends out from the earbud and lines the antihelix fold, one that could provide even pressure and mold itself to the ear's geometry. This could also take the form of a single arm extending from the earbud, rather than a loop. Regardless of anchoring mechanism, the earbuds would then use onboard sensors to determine orientation for sensing and its audio functionality. While the existence of a patent certainly indicates where Apple's work has been focused upon recently, it does not necessarily mean any depicted products or concepts will make their way into products offered to consumers in the future. Earphones with health-tracking capabilities have surfaced in reports for some time, such as the 2014 patent for a biometric headphone system with temperature, heart rate, and perspiration monitoring systems. A 2016 follow-up added language that defined the same concept, but for wireless headphones like AirPods. Today's granted patent is also extremely similar in concept to three patent applications from March 2017, complete with similar-looking images. In November, a change in Apple's trademark for the AirPods name expanded its use to cover "general wellness instruments," including health and fitness sensors, monitors, and biometric data transmissions. The filing is certainly an indication that there could be some sort of tracking facility in future AirPods, but it remains to be seen if it is anything similar to what is disclosed in today's patent.